At Veryfi, we’ve developed an artificial intelligence (AI) bookkeeper that fits in your pocket and is available 24 hours a day, seven days a week. Veryfi’s AI-mobile apps automate bookkeeping data entry and categorization, simplify job costing, and connect the field and office to provide financial stakeholders the data they need in real-time. This all happens in less time than it takes to read that sentence. Data-privacy and security is in our DNA. Our Veryfi web and smartphone app complies with the Health Insurance Portability and Accountability Act of 1996 (HIPAA) and the General Data Protection Regulation (GDPR) giving peace of mind to thousands of small businesses, contractors, and freelancers in the United States. It’s also trusted by large organizations such as JLL, Microsoft, and Shell. 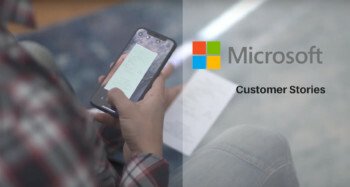 But without Microsoft Azure, and the incredible support we get from Microsoft for Startups, we would not be able to offer this safe, reliable, and secure machine-powered end-to-end bookkeeping solution. Before starting Veryfi, we experienced firsthand the pains and time lost on small business bookkeeping and data-privacy issues surrounding primitive models that rely on farms of human labor for data entry, categorization, and reconciliation of statutory tax obligations. That inspired us to turn to artificial intelligence and start creating a bookkeeping platform. That vision also led us to be selected and backed by Y Combinator, the prestigious Silicon Valley accelerator that launched such multibillion-dollar companies as Airbnb, Dropbox, Zenefits, and Twitch Interactive. Veryfi is the world’s first personal AI bookkeeper that learns how you like things done and then always does them that way. Every time a customer uploads a receipt, records mileage or time on project, Veryfi gains new insights. And because it’s always learning, it’s always getting smarter. It’s a bookkeeper that never sleeps and is always available when you need it. Traditionally, product or feature releases are slow, complex, and mentally draining because developers have to stop building, refocus, and babysit the release process. We wanted to remove these pains and make releases run like a background task with minimal intervention—true to Veryfi’s vision to simplify, optimize, and automate the boring parts of accounting. This required us to adopt an approach called “Continuous Integration/Continuous Deployment” (CI/CD). While not for the faint of heart, it would allow us to roll out improvements to our customers in almost real time without the typical pains of deploying code to production. After a lot of research, we instrumented Docker, Swarm, Jenkins, and BitBucket GitFlow to automate and manage our deployments. But on which cloud platform? We knew we would need two things: simplicity in deployment and expert support. Since CI/CD was new territory for us, we knew we needed a partner who could provide technical expertise and not just a warm body in a call center. We worked very closely with support teams at Microsoft, not just on baseline issues but on very complex tasks like when we needed to rotate databases to decrease lag and ran into trouble. Our Microsoft contacts took care of it within hours. We saw that pattern repeated again and again—our priority was their priority. And it didn’t stop there. Just about everybody in the cloud space is familiar with Jessica Deen. She’s a talented engineer who now is a cloud developer advocate at Microsoft. She heard about a problem we were having, met up with us at a café, and spent half a day helping us solve it. We’ve never experienced that level of support from any other cloud provider. Privacy and security are all over the news lately. And together they’re a cornerstone of our approach. We’re the only company in our space that doesn’t expose your information to outsiders by outsourcing data entry to third parties. We refuse to compromise on your data privacy and security, and we expected the same from our cloud provider. Azure meets more privacy certifications than any other cloud provider. Since graduating from Y Combinator, we have passed some significant milestones. For example, we recently processed our 4 millionth receipt and we’re already breaking even, which is remarkable for such a young startup based in Silicon Valley. And while Veryfi—both our app and our company—keeps learning, we already know one thing for sure: Building a company based on cutting-edge AI technology requires absolute confidence in a platform and provider. Even the smallest amount of doubt or concern can undermine everything. With Azure and Microsoft, we never have to worry about our product or support.